Foxing can visually be described as the reddish brown stains which appear on your watercolour as small spots or blotches. Foxing can be caused by both mould as well as metal contaminants in the paper, iron in the water source as well as dirt/pollution. With the absorption of moisture, the metal contaminants within the paper oxidise which leads to the visible signs of foxing therefore the process is exacerbated by damp environments and high humidity. How do I remove Foxing from my watercolour? 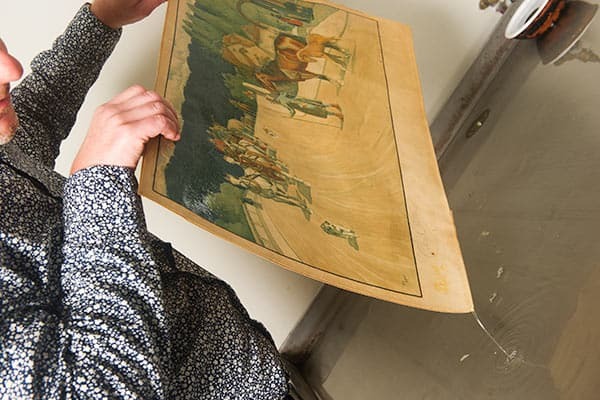 Aqueous or non-aqueous methods can be used by the restorer to address foxing to remove the distortion without compromising the aesthetic integrity of the watercolour and paper support. 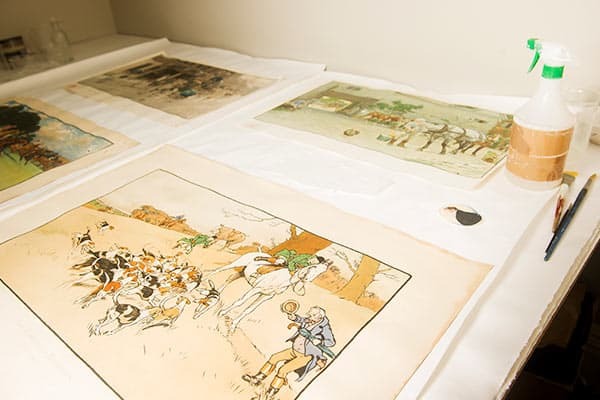 Crucially, each piece is different and will present individual challenges, for example young watercolours are often incredibly vulnerable to treatment. Bleaching followed by de-acidification by a trained conservator may be able to address foxing but crucially, controlling the environment should reduce the initial distortion from occurring. 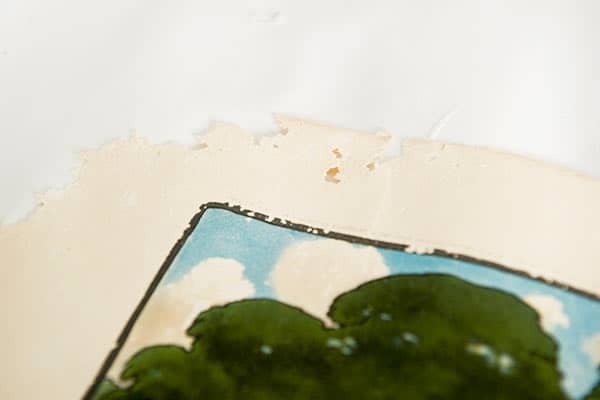 Yellow and brown paper stains can be caused by adhesive tapes (sellotape) or glue used to fix the picture in the mount indeed, self-adhesive tapes can be particularly damaging because the adhesive penetrates into the paper which presents a highly challenging removal procedure. How do I remove pencil marks from my watercolour? Pencil (graphite) markings on your watercolour can be removed with Draft-Cleaning Powder or a soft eraser and should be removed prior to wet treatment as moisture may fix the marks in the paper. Contrary to traditional accounts of using bread to clean watercolour painting, bread should NOT be used to clean your painting. How do I remove dust and dirt from my watercolour? Particulate matter from the environment may settle on your watercolour if unglazed and react with the painting which may lead to distortions on the surface. Glazing your painting will offer protection to the surface against particulate matter and would therefore be recommended. However, a soft brush can provide an accessible means of removing particulate dust and in addition, a finely grated eraser may also be applied to the paper with the aid of cotton swab. How do I treat smoke damage? An accumulation of air pollution, chimney smoke and nicotine can lead to the discoloration of your watercolour and again, preventative measures of glazing may reduce the risks of such damages occurring. However if your painting does present extensive discoloration, measures can be taken to restore your watercolour including surface oxidation, a non-contact technique which applies atomic oxygen generated under low pressure to remove soot on the watercolour however for such techniques, the consultation of an experienced conservator may be required. How to remove nicotine from my watercolour? Like smoke damage, nicotine can cause discolouration in your watercolour with a more yellowed tone and similar processes of stain removal can be followed.